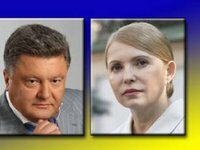 Ukrainian President Petro Poroshenko and Batkivschyna all-Ukrainian Union Leader Yulia Tymoshenko at a meeting discussed the process of formation of a coalition in the newly elected parliament, the Batkivschyna press service reported. "A meeting of Batkivschyna Leader Yulia Tymoshenko and Ukrainian President Peter Poroshenko took place. They spoke about the process of forming a coalition in the newly elected Verkhovna Rada. The talks were constructive," the statement reads.